The highest-rated QB in the recruiting rankings era is a fellow named Vince Young. The second highest-rated is Trevor Lawrence, who just beat up on Nick Saban’s Alabama to win the national championship as a true freshman. 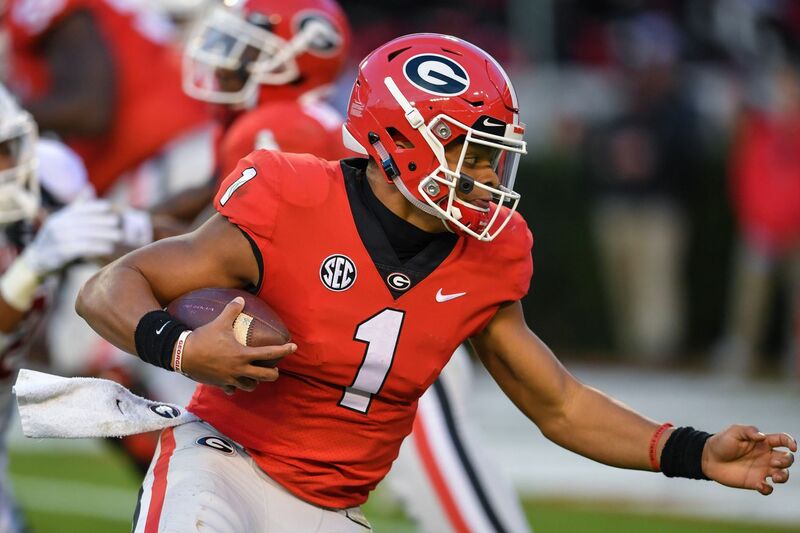 The third-highest-rated QB in the rankings era is the one who came in just behind Lawrence in the class of 2018: Justin Fields. Fields’ freshman year was arguably more dramatic than Lawrence’s, if much more tumultuous. The freshman passer signed with in-state power Georgia, which was returning Jake Fromm, who’d just gotten the Dawgs to the title game as a true freshman. Fields spent the season sitting behind Fromm, with his major opportunity to shine coming when, in the SEC Championship, he was a key part of an ill-advised fake punt that helped Bama win. The QB who won that game for Bama, Jalen Hurts, was supposed to be the offseason’s most popular transfer. But after that debacle, Fields took that mantle. He entered the transfer portal and, shortly after the Sugar Bowl, picked Ohio State as his next destination. On Friday, two days after Signing Day, Ohio State announced the NCAA had approved a waiver to let him play in 2019. In Fields, Ohio State is getting one of the most athletic prospects ever. For years, Fields has tantalized coaches with QB skills to go along with all that athleticism. There are more than few examples of Fields uncorking absurdly long post routes down the field, buying himself time for his wideouts to execute double moves, or simply shaking off would-be tacklers like small children and taking off on long scoring runs. He is an obvious nightmare to contend with in a spread concept, with his ability to reach targets way down the field or run over and by a lighter defensive box. Fields’ cannon arm and overall physique and athleticism made him a blank canvas for recruiters. But of course, even as a high schooler, a QB tends to get a lot of valuable reps that start to define who he is as a player. At Harrison High School and in limited action at Georgia, Fields’ comfort zone was twofold: a) spread option run plays, and b) vertical throws. In his senior year, Fields threw for 1,417 yards and ran for 920. His team’s leading receiver was Steven Peterson, a three-star who eventually went to Coastal Carolina. Peterson had 57 catches for 1,157 yards and 11 TDs, while nobody else at Harrison had more than 539 receiving yards. The name of the game was Fields drawing in defenders with the run and then chucking it over the top to his favorite target, Peterson. This is a standard zone-read play with a lead blocker on the edge for the QB. UMass devoted an extra man and had this well defended on the chalkboard, but a combination of Georgia’s muscle on the OL, a bad angle by the middle linebacker, and Fields’ ability to plant and cut meant it was still a solid gain for the Dawgs. Here, Georgia has Mecole Hardman running a slot fade on a nickel. So long as the Dawgs pick up the safety blitz (they do), Fields has the time in pocket to drop a bomb (he does). In Ohio State, Fields is getting an offense that can showcase his talents. New OSU head coach Ryan Day has a strong reputation as a QB-whisperer, which played into Fields’ choice of the Buckeyes. J.T. Barrett’s passing numbers improved dramatically under Day’s tutelage in 2017, and Dwayne Haskins put up arguably the best passing season in Big Ten history working with Day in 2018. Next up: Fields. The crossing routes of the mesh play are what Ohio State is now known for executing at a high level. It’s part of a national progression of spread innovation that’s made creating matchups and beating match or man coverage the keys to high-level offense. In some respects, it’s not a complex system. It’s just built around well-repped timing and understanding of how to attack a defense. The throws and reads go after the middle of a defense in a way Fields has never been asked to do in the past, because his teams have generally worked the middle of the field with the QB run game before using his arm to get the ball downfield and to the perimeter. This scheme will give Fields experience identifying matchups and throwing all around the field, while letting him do what he’s best at. And it’s not like Day doesn’t have experience working with running QBs. Fields has the potential to give Ohio State a spread running weapon like Barrett and a downfield passer along the lines of Haskins, even if he doesn’t put up the same huge totals off the bat. For Fields to evolve into a pro-style passer, he needed to go somewhere that would give him high-level teaching and reps. Ohio State can offer that. Day will also give Fields an opportunity in an offense that asks him to show precision in reading defenses and throwing quickly and accurately. Now, the Buckeyes will have at least two years to try to win a championship and not just get Fields drafted, but help him reach the college achievements of the only two QB recruits who have ever gotten higher ratings.